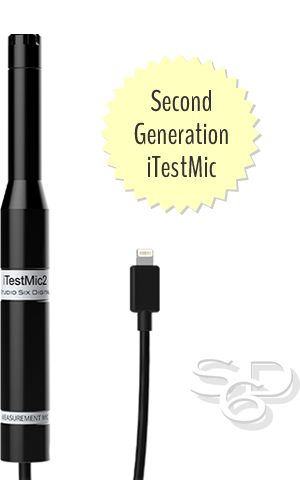 iTestMic2 is the only direct-connect iOS calibrated test & measurement microphone that includes a 3.5mm analog audio output and iOS device charging from an external power supply. Plug it into your iOS device for instant, accurate SPL readings and long-term noise studies. 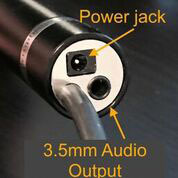 On the bottom of the microphone is a 1.3mm 5.0VDC power jack input for iOS device charging. A universal voltage AC power adapter is included. iTestMic2 includes a 3.5mm (1/8") stereo analog audio output jack for test signals as well as general purpose audio output. Note that this is a full-level output and does not respond to iOS level controls. The dual-gain range mic preamp, A/D converters, D/A converters and USB digital audio interface are all contained within the mic itself, so no Apple analog electronics are used. This lets us bypass the heavy filtering and compression that are normally in use, and also to store calibration values that are read by software. iTestMic2 is equivalent to having a pro Type 2-class test & measurement mic, low-noise matched preamp with two fixed gain ranges, A/D converter, DAC, and USB digital audio interface, all combined in one portable device. iTestMic2 meets ANSI / ISO Type 2 specifications for frequency response, linearity, and directional characteristics. We do not guarantee that this microphone can meet the strict environmental requirements of Type 2 or Type 1.